What Types of Programs are Used by Consumers Who Access Mobile Health-Related Applications? Forty-nine percent of surveyed U.S. consumers who access mobile health-related applications say they use an app for healthy eating, according to a recent report by communications firm Ruder Finn. Among surveyed U.S. consumers who say they access mobile health apps, the report found that 48% say they use an app for fitness and training, 41% say they use an app for general health information, 13% say they use an app to manage chronic conditions and 9% say they use an app for medication reminders. For the report, Ruder Finn in October 2012 surveyed 1,000 consumers, 670 of whom had access to a smartphone, a tablet or both. 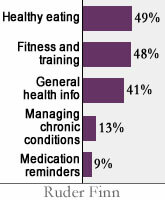 About 16% of the smartphone and tablet users said they regularly access a health-related app. If you are looking for ways to stretch your grocery budget, start by not throwing away your leftovers. Here are some creative ways to use those leftovers that will please both your family and your wallet. Mashed potatoes: Make potato pancakes, croquettes or potato-leek soup. Rice: Use up leftover rice, plus whatever vegetables and protein you have on hand, in a delicious one-dish meal. Wine: Don’t pour leftover wine from your dinner party down the drain! Instead, pour the remainder into a resealable bag and freeze it. Next time, make a sauce after sautéing meat by adding a 1/2 cup of your reserved wine and a bit of butter. Pasta: Frittatas are a common way to use up leftover vegetables, but did you know you can use the same technique with leftover pasta and sauce for a more substantial dinner? Get the recipe. Leftovers don’t have to be boring or tasteless. All you need is a bit of creativity (or a computer) to turn the expected into the unexpected. Cha Ching and Bon Appetit! Arugula: It has a peppery flavor and only stays fresh for a couple of days. It’s ultra-low in calories and packs a healthy dose of vitamin K. It’s best in the early spring. Dandelion Greens: They have a bitter, tangy flavor and are good in salads or warm dishes. They’re packed with vitamins A and K (per cup, more than 100 and 500 percent of the daily value). The best greens pop up during early spring and should be bright green and crisp. Fennel: A cup has 3 grams of fiber and 17 percent of the recommended daily value of vitamin C. The flavor is similar to licorice, but sweeter and subtler. Radishes: These roots are at their best all spring. While they’re popular in salads and slaws, try them hot in pasta on those nights before spring really warms up. They’re rich in B vitamins and potassium, but low in calories. Leeks: Considered a Super Food, they are a part of the onion family but have a subtler, sweeter flavor. While these green beauties are available year-round, their flavor is best during the spring and fall. Artichoke: In season from March to May, Artichokes are a great source of prebiotics, which feed probiotics, and help with digestion and protect the body from other bad bacteria. Sugar Snap Peas: Low in calories and a great source of vitamin C (more than 60 percent of the daily value in one cup). They’re great raw, but can be cooked, too. Look for plump, bright green pods. Enjoy the bounty of each season and you will enjoy produce as it was meant to be eaten; fresh and full of health sustaining vitamins and great flavor.